Dan Feitel gave me a few near-heart attacks last week. Maybe I should just stop watching until he’s done. Naaaaaah! I’m a sucker for punishment! And what could go wrong here anyway? Clearly he showed he is capable of restraint last Friday, when he went for the lockout + $1. I don’t know if I can watch. We all know what’s coming. If Victoria doubles her score, she’ll have 15,200. 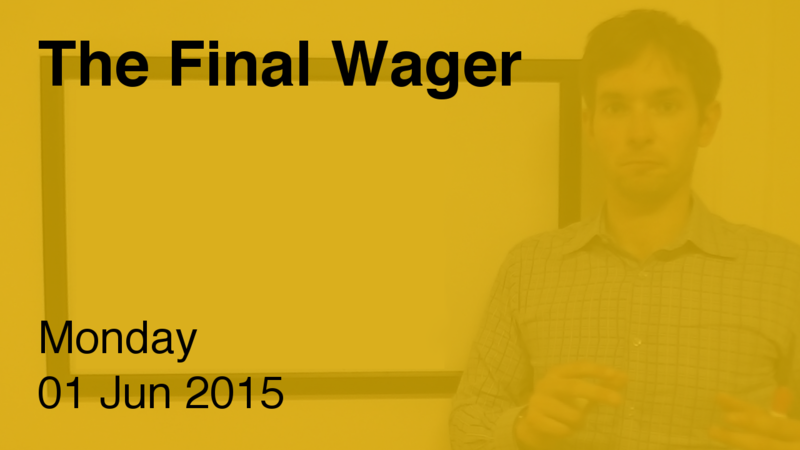 To cover this all-in wager, Dan will need to wager 1,200. An incorrect response with that wager will leave Dan with 12,800. To get above his total, Victoria must wager at least 5,200. OK, OK – I’ll be somewhat flexible on Victoria if she wagers, say, $7,598. And both players have somewhat larger ranges than these two calculations provide. Oh, man. Victoria clearly doesn’t want to win, but Dan gives her a shot at another game anyway! I hear what you’re saying: “Maybe Victoria knows about Dan’s wagering strategy, and is playing smart!” Well, she could play just as smart with a wager of $6,401 or even $5,201 – she’ll win on a double-stumper and also win on a solo get against rational wagering. Here, she doesn’t even give herself a chance against a totally feasible $6,399. Ay carumba. Shout-out here to Randy, who did appear to want to win this game, and made a Daily Double wager to prove it; it’s sad that he takes home just $1,000 for his efforts. Dan is up to 5 wins and $127,998, and looks to join Alex and Kerry on the six-game list tomorrow. What is the shot clock? If Victoria knows Dan’s wagering strategy, AND she knows she’s terrible at sports knowledge,then I don’t think it’s a bad bet wagering $0. If she knows that Dan’s going to bet it all minus $1, then her only chance to win second place is for him to miss. And, if she knows that she’s is terribly poor at sports knowledge, then why bet money on a question you know you’ll miss? If Dan would have missed, she would have made the most amount of money she could have, by not wagering anything. It is true that this reason stands only on knowledge of both her own sports trivia abilities and knowing Dan’s betting, but if she knows both to be true, then she is making the best of a poor situtation. Yes. Victoria’s wager is exactly what I suggested for Andrew last Friday, except that in Andrew’s case it would have worked out horribly.